Three compartment Tap Set Boxes are the best packaging option for high quality set-of-3 hand taps. Designed to hold ISA, DIN and ANSI Series taps, Tap Set Boxes are durable, re-useable and conveniently stack for safe handling and storage. 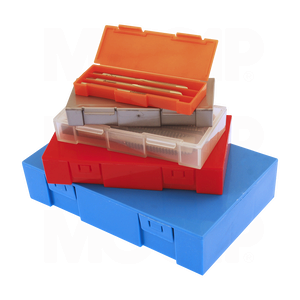 Tap Set Boxes are available in transparent Polypropylene (PP) and is 100% recyclable. Additional colors available.